‘Every new beginning comes from some other beginning's end.’—Semisonic, Closing Time. The Kawasaki ZX10R Masters have found a new beginning, a new playground, a new home—the Extreme Festival. Welcome to the brave men of the Kawasaki Masters Cup. Your season starts NOW! At the end of 2012 a trial run was held with great success, heralding the Kawasaki Masters into a more prolific direction. Spectators will be awed by the new class which was added to the Extreme Festival programme. 'You will like what you see', said team captain and contestant Johan Fourie #19. On the starting grid, Stewart MacLeod (2012 champion), is ready to defend his title. Chased by Brian Bontekoning #16, Pieter de Vos #17 and don’t forget The Devil himself, Tony Klem (yes you’ve read correctly). The Devil will be turning up the heat on bike #13, throttling hard against some of the best scoot jockeys in the motorcycle racing industry. Contortionist Gavin Lightfoot #32 (an unexpected last minute surprise) will also fill up the starting grid. Ever seen a man that bends like warm liquorice on a hot motorcycle track? Well, now is your chance. Hopefully Cirque du Soleil will not require his talent very soon; Stewart MacLeod might be thinking otherwise. An even greater surprise is the return of the tenacious Stewie Christie #65. Last year an unfortunate accident almost delivered the dog doctor to the great beyond, after a full recovery he is finally back in the race seat—WELOME back Stewie, welcome back! The Kawasaki Masters are divided in to two classes—class A and B (may the ignorant few please pay attention now). Class A, are represented by the 35 – 44 age group; class B the older than 45. If you think it is a bunch of old toppies (middle aged men) burning fuel and tyres at an alarming rate just because they are fed up with boring Saturdays mowing the lawn, then you are mistaken. Actually there is only one Toppie in the whole team, JB Schoeman #23 (the real Tony Soprano). This year the entry list is loaded with 27 entries, all straddling Kawasaki ZX10Rs, with minimal modifications to the race bikes. The exception is of course, exhaust systems, rearsets, lap timers, after market fairings ... Also, each scoot jockey will bear his number on the front and side of the bike, pimped out with the latest livery and sponsorship markings. Red Square (the energy drink people) is on board with tyre sponsor Bridgestone, keeping the MEN glued to the quick and short Zwartkops racetrack (2.4km), at speeds in excess of 240km per hour. 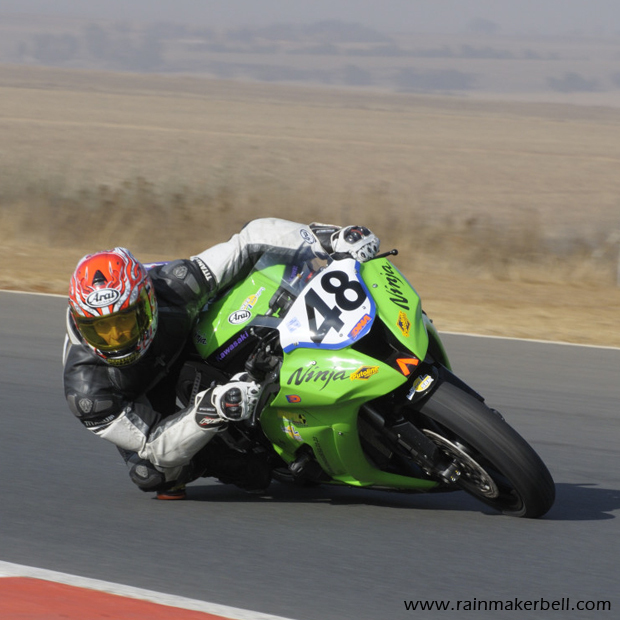 Words & Photo: Adriaan & Martine Venter (Kawasaki ZX10R Masters Cup, Extreme Festival, Zwartkops Raceway, South African Motorsport, 2013/01/24) Main Image: Gavin Lightfoot #48 (#32), Kawasaki ZX10R.